If it’s a sunny day, and you find yourself in Tokyo, you must — must! 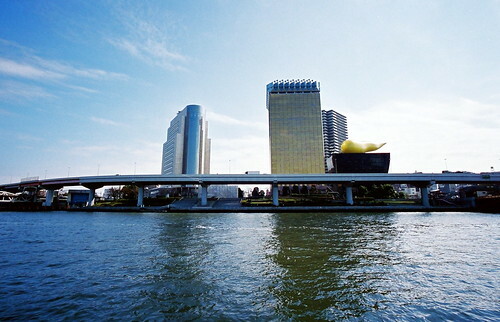 — take the Sumidagawa river cruise that starts in Asakusa. 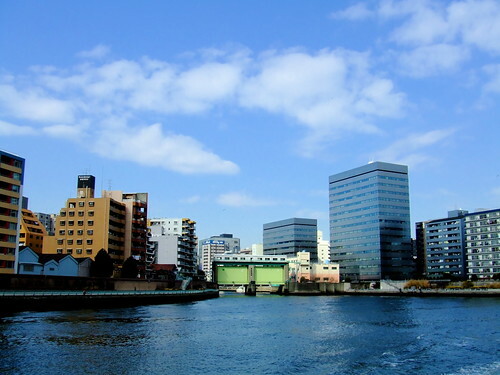 When visiting Tokyo it’s almost too easy to forget that Tokyo is located right on the water. 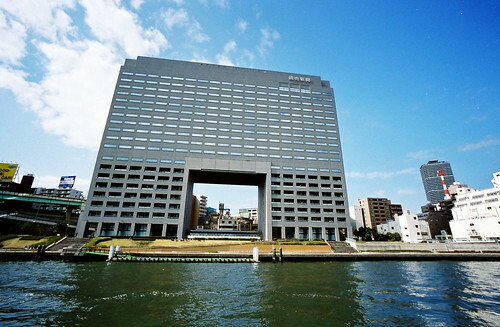 In fact, Tokyo is so built up that you rarely hear mention of a Tokyo waterfront, or shipyards, or anything else maritime. And yet, Tokyo Bay sits right at the heart of the greater Tokyo metropolitan area, a flat reflective expanse in the middle of a vast urban explosion. So why not glide out into the center of it? By leaving the city behind you actually get closer to it. Instead of the immediacy of locality that you get when you’re down in the city streets, you can become a kind of Kantian spectator, viewing the city from a distance — and you don’t even need to go to the top of a skyscraper. On the river you get key access to scenes of the city’s inner workings — its patterns of shipping and transportation, vista-wide views of conurbations that are hard to decipher when you’re in the middle of them, and a sense of the scale of the city that is vastly different from what you can experience on the various train lines. Plus you get to pass beneath thirteen different bridges that range in style from steel-truss construction to the curved tensions of suspension bridges. I’ve always loved bridges and their floating architectural quality. Viewing bridges relaxes me, and slows me down. Each bridge has its own aesthetic force and organizes my conscious experience of it in a different way. And did I mention that the cruise provides a running commentary about the bridges? And that you get to feel breezes too? 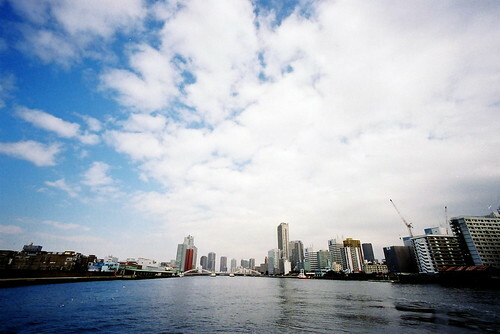 Below are a few photographs taken during the Sumidagawa river cruise. With commentary. 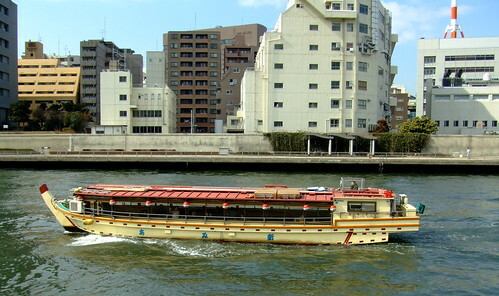 This is one of the many lovely pleasure boats that ply the waters of the Sumidagawa. These ones are especially lovely at night when their lanterns are on and the boats move lazily through their own brightly patterned reflections. Unfortunately, the ‘cruise ship’ that I was on bears no resemblance to these boats. The Sumidagawa is lined with homeless shanties such as these. 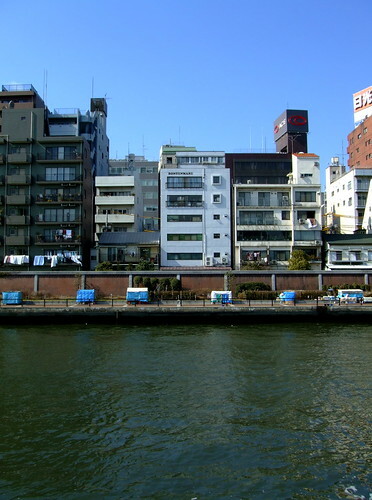 The juxtaposition between the river-view apartment complexes and the blue boxes that are the typical dwellings of Tokyo’s homeless can be quite startling. On the other hand, compared to the cardboard shelters that are constantly being torn down by America’s police while the homeless are asked to ‘move along,’ these shelters are relatively permanent. 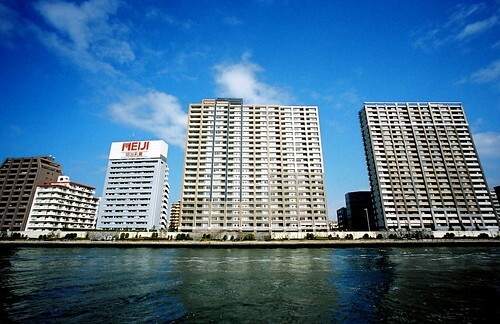 Giant highrises along the Sumidagawa. One nice thing about taking the river cruise is that you actually get to view buildings in their entirety, as ‘scenery’ and vista, and you get a sense of horizon too. In a strange way it’s like stepping out of Tokyo, even though you’re right in the heart of the city. I wonder what the dollar value is for every square meter of space that’s been emptied out of the belly of this building? One of the thirteen bridges that you pass underneath during the river cruise. 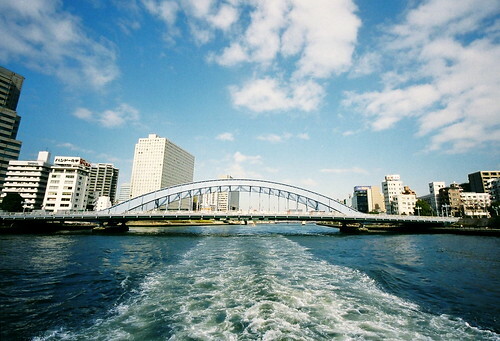 I believe that this is the Eitaibashi Bridge. I’m not sure if this is the one, but one of the bridges is actually so low that a steward comes onto deck to make sure that you’re not standing up because you might hit your head as the boat drives beneath. I’m not sure what this giant green gate is for, but I like it. 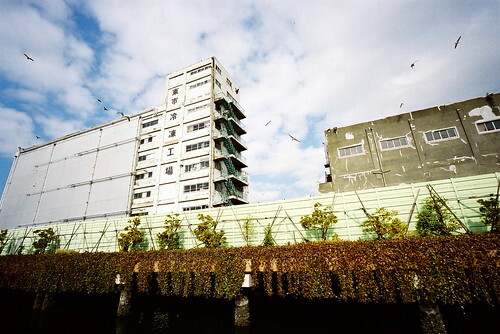 This is the waterside view of Tsukiji Fish Market, the world’s biggest fish market. It’s a fish market. That’s why there are so many seagulls in this photograph.